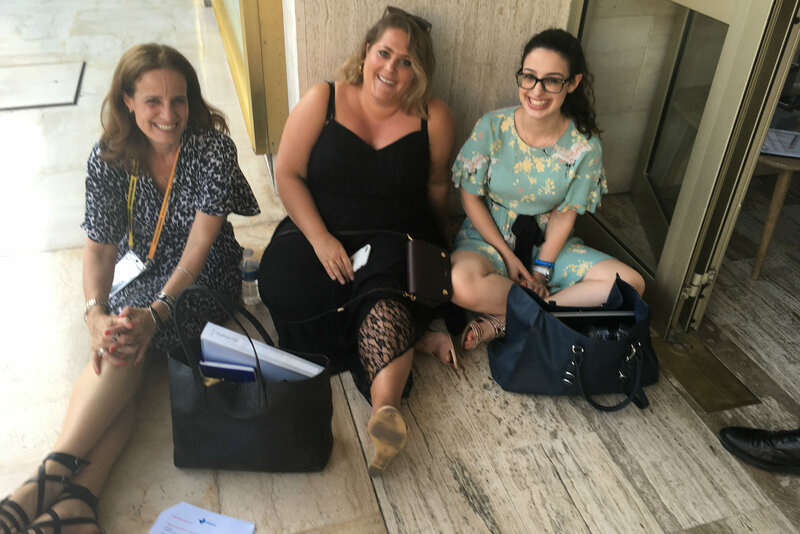 PRWeek's man in the Croisette brings you the gossip and high jinks from Cannes, including Edelman's elevator woes, jurors working hard, and agency boss gets stuck in toilet. When it comes to elevator pitches, team Edelman are certainly up there… or rather, they’d be up there if they could. The world’s biggest PR agency held a drinks party at Cannes this week, but instead of their usual spot – around the pool at the Martinez Hotel – this year the event was held at Edelman’s HQ for the week; the ninth floor of a block overlooking Le Croisette. What a lovely idea, one would have thought; a sunny terrace surveying the rosé-quaffing masses below. But on arrival, the safari-suited Flack was met with the most unusual elevator pitch from Edelman’s PR and marketing team: it (ie, the lift) was ‘temporarily out of action’ and would we like to retire to the ground floor bar for a lovely glass of Champagne. Now, Flack has never knowingly refused a quickly accessible glass of bubbly. Still, on this occasion he was determined to make it up the stairs to join the (fortunately) elevated company on the ninth floor. Walking up 18 flights of stairs in 30-degree heat, without spilling a drop of brimming Lanson, proved quite a challenge even for PRWeek’s spritely representative. It was worth it, of course, for the chance to rub shoulders with Richard Edelman himself, who looks like he could run up nine floors without missing a beat; the newly appointed European COO Michelle Hutton; and UK consumer supremo Ruth Warder, just returned from maternity leave. Also in attendance was the Rev. Jesse Jackson, who had shared the stage earlier with Edelman’s CEO. That said, Jackson was looking a little jaded, prompting Flack to fret that they had just made the 77-year-old civil rights campaigner stagger up those killer stairs. But, after another couple of glasses, Flack’s worries disappeared until (and the way down did seem strangely easy…) on arrival back in the lobby the party’s hard working organisers – including creative legend Jackie Cooper (below, left) and marketing boss Vanessa Pymble (centre) – were found sitting despondently on the floor. On interrogation it emerged that this hard-working team was now pondering how exactly they would cope with the next day’s packed schedule of events, also based in Edelman’s ninth floor eyrie. Some wicked whispers from Cannes now: which PR agency boss was locked in a toilet for 20 minutes, sans mobile phone, while an important client was forced to wait? Which other agency chief asked for a slightly awkward photograph of himself embracing another industry figure at Monday's PRWeek party to be removed from the picture gallery. It’s not easy being a Cannes juror. Ok, you get housed in a luxurious hotel for several days, but these guys work hard – and late. Take the PR Lions. Jury president Karen van Bergen and her team had to plough through 2,208 entries to narrow them down to 228 for the shortlist and an eventual 100 Lions. Phew. At the press conference on Monday morning, van Bergen (pictured second from left) revealed that her jury didn’t finish their judging until 2.30am. Not all the jury teams burned the midnight oil to that extent, however. 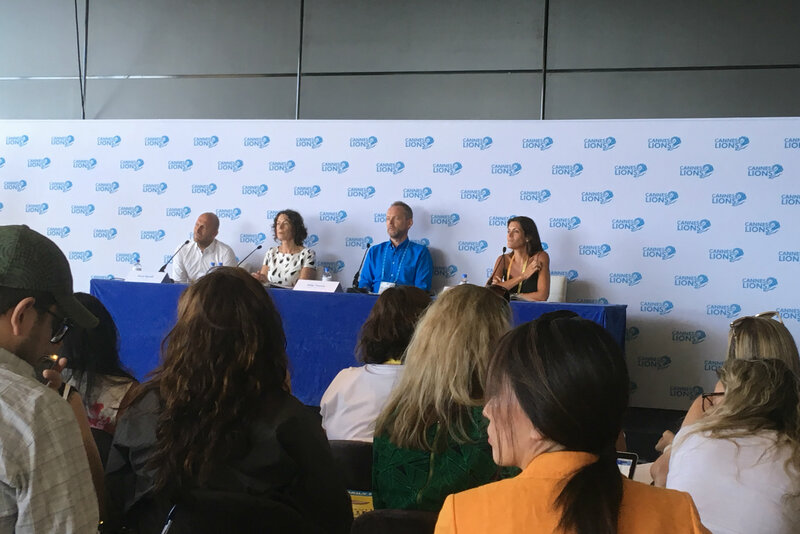 At the same press conference, a relaxed-looking Bruno Bertelli (far left), van Bergen’s counterpart on the Outdoor Lions jury, revealed that his team finished at a much more respectable 3pm. As usual, Cannes was full of plenty of quirky gimmicks and stunts by brands and organisations keen to get delegates talking and social media-ing. This may be Flack’s favourite. 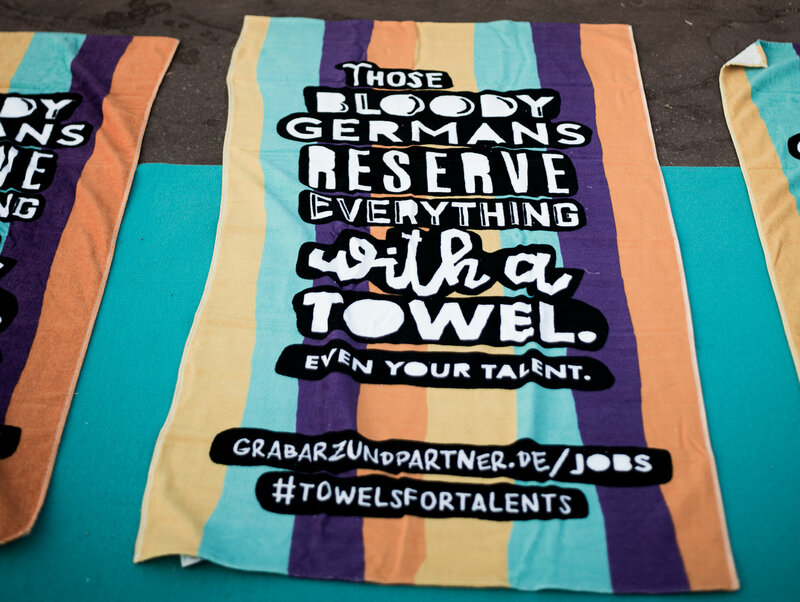 In a nod to the famous German stereotype from ad campaigns of yore, ad agency Grabarz & Partner used towels to ‘reserve’ a 500 meter stretch of Le Croisette at the crack of dawn on Thursday. The towels contained the message: "Those bloody Germans reserve everything with a towel. Even your talent." Potential employees are invited to visit a web address printed on the towels to contact the agency and meet them in Cannes to discuss job opportunities. 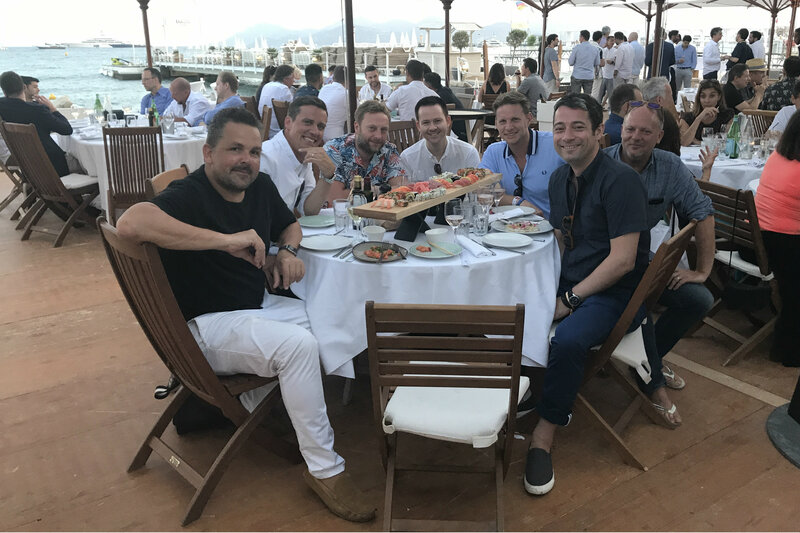 Some of UK PR’s most excellent and glamorous people, along with PRWeek’s deputy editor John Harrington, put the industry to rights on Tuesday evening during what is becoming an annual Cannes get together at Baoli Beach. Left to right is James Herring (Taylor Herring), James’ friend Nigel Gilbert, Warren Johnson (W Communications), Harrington, Mark Perkins (MHP), Chris McCafferty (Kaper) and Pete Mountstevens (Taylor Herring). Superb time had by all. It's become something of a traditional for many of the UK Canneserati (now a word, deal with it) to hop from southern France to Somerset and make the bee line for Glastonbury Festival towards the end of Cannes week. One such agency figure is Angie Moxham, founder of 3 Monkeys, who Flack had the pleasure of sitting in front of on the (inevitably delayed) EasyJet flight to Gatwick last night. Moxham revealed that she's attending Glasto as the guest of Tom Watson, Labour's deputy leader - his boss Jeremy Corbyn is due to make a speech at the festival, of course. 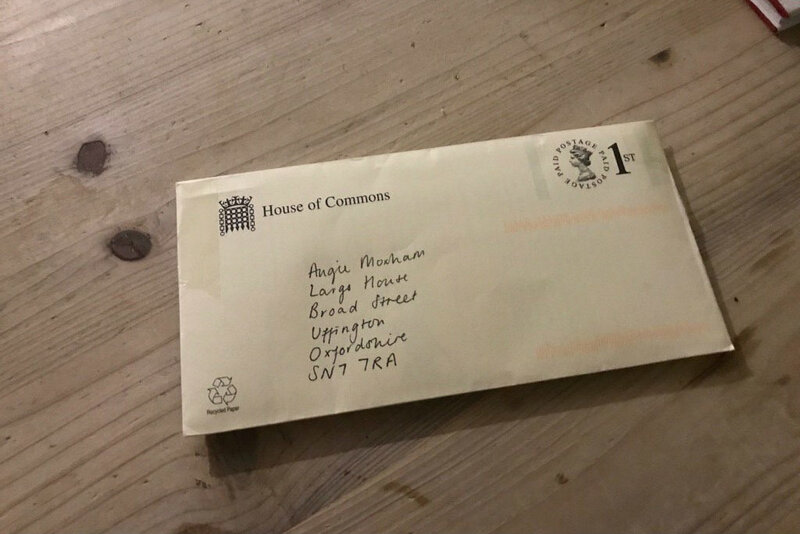 Moxham tweeted a picture of her tickets, sent from the House of Commons, below. Watson has taken on the might of the Murdoch media empire and elements of the Labour Party in his time, but could this be his toughest assignment yet? (Only joking, Angie - have a lovely time). Away from Cannes, earlier this month two-time former world champion Amir Khan put out a request on social media for global PR and marketing support. Of course, this piqued the interest on many in the comms industry. The request, however, looked far from genuine and Flack, alongside several PR pros, was unable to verify its authenticity with a member of Khan’s team. Fortunately, one source close to Flack did get a reply. Unfortunately, they were less than impressed with its contents. The source said: "We are massive sports fans and so when we saw the post, it really got our attention and we followed up by emailing Amir’s team. However, we got a short, two-line reply asking who our clients were, and saying that Amir wanted help with TV commercials and sponsorship deals." To be fair to Team Khan, its request did state the Amir wanted agencies to provide this type of support. The source added: "[The reply from Team Khan] made no mention of a brief, timings, messaging, audience, budget, or anything else that you might expect in this situation. It feels a bit of a tactical ploy by his team to try and bring in a bit of revenue via a PR company’s contacts, rather than it being a meaningful brief or a desire for strategic PR support." Flack, along with the source, wishes Team Khan the best of luck in its search.